Fox’s The Masked Singer is everything you want in a silly, mid-season reality competition talent show – it’s big, it’s colorful, and it has enough pop-culture zaniness to make it worthy of embarrassing conversations at work the next day. Like the Korean game show it’s based on the new The Masked Singer invites 12 celebrities (actors, singers, athletes, etc.) to perform on stage hidden beneath wild costumes. Except in this case, the costumes are more Burning Man animal chic and less durian fruit. It’s then up to the celebrity panel — Ken Jeong, Jenny McCarthy, Nicole Scherzinger, and Robin Thicke — to weigh in on the performances and try to sniff out what famous face is singing underneath the elaborate disguise. Does it make sense? No. But it’s still more enjoyable than scrolling through your Netflix menu for an hour only to decide to watch (another!) rerun of The Office. If you’re new to the experience, or just want to predict which masked character is really Donald Trump (Lion, duh! ), here’s a guide to the competitors. Think you know who a singer is? Tell us your guess in the comments! The Pineapple looks like a dad trying too hard to embarrass his kids on vacation. With fake abs and a simple Hawaiian shirt, The Pineapple could have just as easily walked in off the street from handing out coupons for fruit smoothies. He’s not a singer. He’s not a dancer. And his costume isn’t helping. This was easily the worst performance of the second episode, and so Pineapple got sliced. The Masked Singer Revealed: The Pineapple was Tommy Chong. Voted off in week 2. A hip-hop Hippo? This guy seems better suited for teaching kids to say no to drugs at a school assembly, or maybe get a crowd pumped at a minor league badminton tournament. A winter coat you could buy at Sears coupled with a standard hippo head makes for a lackluster appearance. The performance did not save this dull dud of a look. We appreciate The Hippo’s energy, but his mumbled lyrics to the crowd-pleasing “My Prerogative” sound as if his friends dared him on Karaoke night. Thankfully, Mr. Hippo was sent home on the first night. The Masked Singer Revealed: The Hippo was Antonio Brown of the Pittsburg Steelers. Voted off in week 1. The Alien’s colorful, skintight red latex and giant, bug head makes us think this masked singer’s costume was inspired by Invader Zim fan art. She’s not a strong singer, and doesn’t do much dancing either. Then again, it can’t be easy to sing and dance with a bowling ball on your head. Trust us, we’ve tried. In her family anonymity is a completely “alien” concept. She grew up in the public eye. She gets to share her voice now on her terms. The Masked Singer Revealed: The Alien was La Toya Jackson. Voted off in week 7. Wild, in a good way, The Deer pranced onstage like a character from a Guillermo Del Toro fever dream, complete with giant antlers and gas mask. While not the flashiest of costumes, there was a maturity about The Deer, with his long coat and armored gloves, that makes us wonder if perhaps he was meant for an episode of American Horror Story or Game of Thrones instead of a silly game show. Unfortunately, like most deer, this one didn’t dance much. Speculation quickly grew that he was not a singer, but a former athlete. Our best guess is Michael Strahan who found time between working eight other hosting gigs. The Masked Singer Revealed: The Deer was football legend Terry Bradshaw. Voted off in week 3. The voice isn’t strong, but isn’t too annoying either. Overall, a bit forgettable. Spent most of his life on stage, but never alone. Has previously performed in a mask. The Masked Singer Revealed: The Rabbit was Joey Fatone of NSYNC. Voted off in week 8. This character stays on message with every part of the all-black costume working together to convey a feeling of feathers, fright, and flight. From the ornate head/beak to the business suit that transitions into feathers, the Raven looks like a perfect Batman villain. The voice is a bit flat, but what do you expect from a raven? We’re just glad she didn’t keep croaking nevermore. They’ve spent their life listening to other people’s stories and no one talks more than they do. They recently suffered the tragic loss of someone they loved. The Masked Singer Revealed: The Raven was Ricki Lake. Voted off in week 6. Wonderfully weird and horrifying, the Bee is ripped from the most illegal and scandalous furry convention and is here to haunt your dreams with a face only a blind mother could love. The goggles, the wings, the antenna – more bee, please! Singing was good, dancing… not so much. The stage moved more than she did. It’s ok! We still love you even though you look like one of Skeletor’s henchmen! The Masked Singer Revealed: The Bee was Gladys Knight. Revealed on the final episode. Although our favorite Unicorn will always be Ryan Reynolds, this Unicorn has a look that screams, “Jim Henson” but whispers, “Pee-Wee’s Playhouse.” The mask and costume work well together and looking at her, there’s no mistaking what the designers were trying to achieve. Even if we’re never going to sleep again. A stilted baby-doll voice is especially creepy when coming from the mouth of giant horse head. While nightmarish may not have been the intent, the feeling of watching this magical horned horse sing was more ghostly than angelic. Lacked confidence because she lost her sheen and people told her she wasn’t worthy. She plans to exude model behavior and going for the gold. Wanted to be a singer but someone she admired told her she was tone deaf. The Masked Singer Revealed: The Unicorn was actress Tori Spelling. Voted off in week 4. Aside from the mask and hair, this costume would be perfectly suited for a Britney Spears show. It’s not a bad design choice, but one of the more tame ensembles. And that’s saying a lot considering how the size of the crystals in the headpiece. The performance sounds like that of a reality star instead of a pro singer. We’re really going to regret this if it’s Lady Gaga. Using her voice to help others is very important. The Masked Singer Revealed: The Lion was Rumer Willis. Voted off in week 8. This futuristic pooch would fit in perfectly as the boss in an old Playstation game that we definitely did not sacrifice our summer to play. Oh, youth. She’s definitely comfortable on stage, and while we thought the mask made her voice a bit muffled, she’s got puppy-level energy, so we expect to see more new tricks in the weeks to come. Has loved to be on stage since she was little. Comes from a musical family. Rainbows and free speech are important to her. The Masked Singer Revealed: The Poodle was comedian Margaret Cho. Voted off in week 4. With all those flashy feathers, we half-expected this character to strip while singing… or at least perform a magic trick. His feather-covered legs made us think this might be Big Bird’s arty cousin. That said, his strong voice and bravado make for a rather great performance…even if the bird won’t stop looking directly into our soul. Walked onto the stage at age 5 – was teenybopper and played dramatic roles. But has been famous for a long time – former Vegas showman. Was friends with Michael Jackson. Had many incarnations of his career. The Masked Singer Revealed: The Peacock was Donny Osmond. Revealed on the final episode. The Monster looks like a cute reject from a high school stage production of Pixar’s Monster’s Inc.. The designers were clearly going for a Japanese mascot vibe, but the end result makes the Philadelphia Flyer’s new mascot Gritty look like the James Bond of furry creatures. BUT! The monster’s voice is amazing! This is clearly a singer who knows what they’re doing. What the character lacks in visual appeal, they make up for with a set of pipes worthy of Queen song. 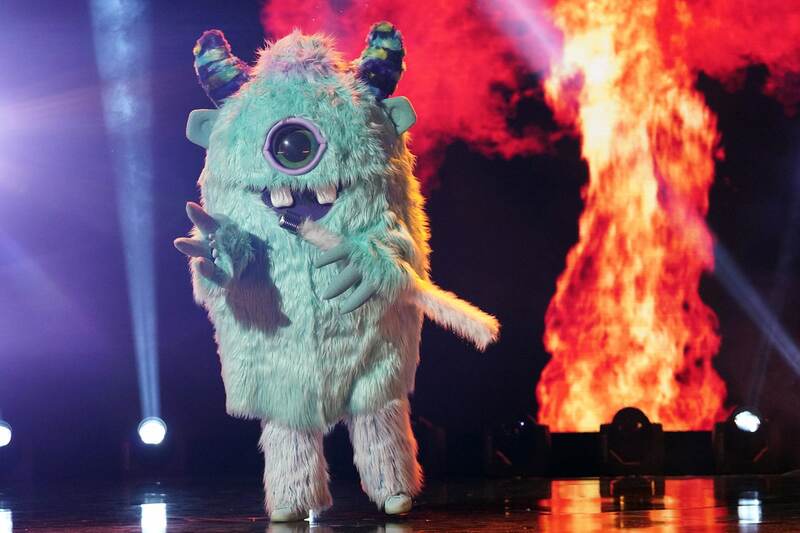 The Masked Singer Revealed: The Monster was T-Pain. Revealed on the final episode.